Clubhouse Birdhouse For Purple Martins [ID 126818]. Exterior grade ply-board for the walls, floor and underlying roof board. Kiln-dried hardwoods, pine and poly-resin for the details. Western Red Cedar or Pine shingles for the roof. 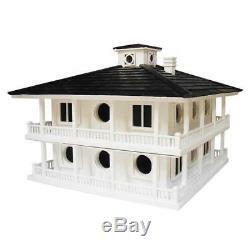 This is the large format of the popular Club House Bird House (HB-2048) inspired by the classic Southern Plantation style clubhouse at the most famous site in the world of golf. 16 Purple Martin families will nest in style in this fully functional house constructed of exterior grade ply-board, pine shingled roof that is topped with a non toxic outdoor paint. The top lifts off with the removal of four screws to allow yearly cleaning. The "Crows Nest" has screened venting to provide additional ventilation. If you have specific questions about this products guarantee, please contact our Customer Service department. 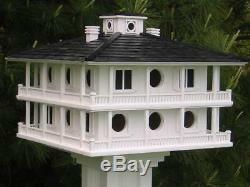 The item "Clubhouse Birdhouse For Purple Martins ID 126818" is in sale since Friday, November 03, 2017. This item is in the category "Home & Garden\Yard, Garden & Outdoor Living\Bird & Wildlife Accessories\Birdhouses". The seller is "shopladder" and is located in Hicksville, New York. This item can be shipped to United States, Canada, United Kingdom, Denmark, Romania, Slovakia, Bulgaria, Czech republic, Finland, Hungary, Latvia, Lithuania, Malta, Estonia, Australia, Greece, Portugal, Cyprus, Slovenia, Japan, China, Sweden, South Korea, Indonesia, Taiwan, South africa, Thailand, Belgium, France, Hong Kong, Ireland, Netherlands, Poland, Spain, Italy, Germany, Austria, Russian federation, Israel, Mexico, New Zealand, Philippines, Singapore, Switzerland, Norway, Saudi arabia, Ukraine, United arab emirates, Qatar, Kuwait, Bahrain, Croatia, Malaysia, Brazil, Chile, Colombia, Costa rica, Panama, Trinidad and tobago, Guatemala, Honduras, Jamaica, Antigua and barbuda, Aruba, Belize, Dominica, Grenada, Saint kitts and nevis, Saint lucia, Montserrat, Turks and caicos islands, Barbados, Bangladesh, Bermuda, Brunei darussalam, Bolivia, Ecuador, Egypt, French guiana, Guernsey, Gibraltar, Guadeloupe, Iceland, Jersey, Jordan, Cambodia, Cayman islands, Liechtenstein, Sri lanka, Luxembourg, Monaco, Macao, Martinique, Maldives, Nicaragua, Oman, Peru, Pakistan, Paraguay, Reunion.